The Redemptorists » "O God, give me holiness!" St. John Neumann prayed these words — "O God, give me holiness!" — on his ordination day in 1836, and lived them until his death on a Philadelphia street corner this date in 1860. Today we celebrate the feast of this humble man who became the fourth bishop of Philadelphia and the first male American saint. We also continue to celebrate the Neumann Year, which will end on June 23, 2012, with a special Mass in Philadelphia. Archbishop Charles Chaput will be the celebrant, and Redemptorist Archbishop Joseph Tobin is scheduled to be the homilist. Stay tuned to redemptorists.net/neumann for more details. Other ongoing Neumann Year events include our second annual Essay Contest for Catholic school students in grades 6-12. Entries are due February 13! 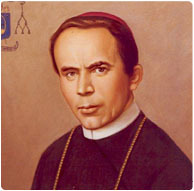 And in March, the traveling relics of St. John Neumann will visit the Basilica of the National Shrine of the Immaculate Conception in Washington, D.C.
"Our daily prayer for you is: ‘that your charity may more and more abound in knowledge and in all understanding that you may approve the better things: that you may be sincere and without offence until the day of Christ, replenished with the fruit of justice, through Jesus Christ, unto the glory and praise of God.’ May the Divine Mother and her son bless you all."